Minutes to Misquamicut Beach in Westerly, Rhode Island. 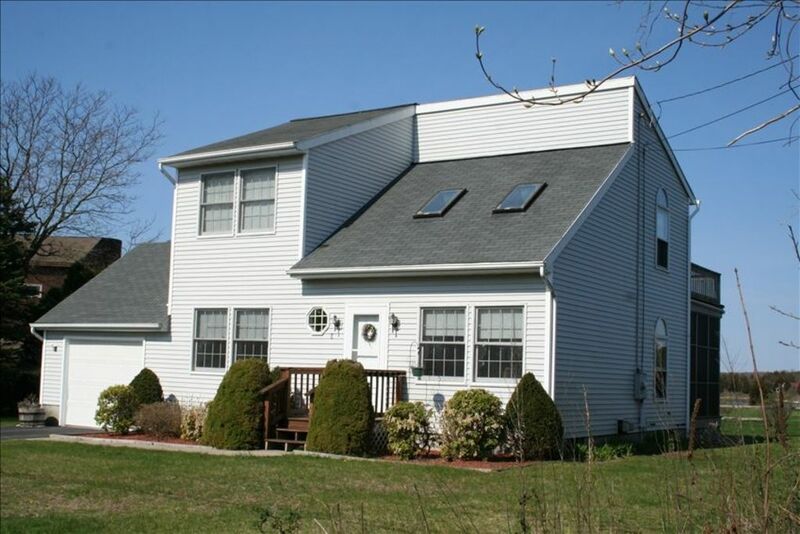 This 3 bedroom home with loft is adjacent to Winnapaug Pond on a quiet dead-end street. House looks west over Weekapaug Golf Club with spectacular water views from two sliding door decks (one upper deck, one screened-in deck for dining). Enjoy Winnapaug Salt Pond for boating, sailing, kayaking/canoing, fishing, jet skiing, or clamming. Pond has access to the open ocean through the Weekapaug breachway. Enjoy the private outdoor shower when your beach day is over. This home has a bright, airy, open floor plan with master bedrooms up and down, each with a full bath. The open kitchen, dining area and living room are perfect for entertaining. The home is located conveniently close to popular areas including Watch Hill, Mystic Seaport, and Foxwoods Resort as well as many beaches on the Rhode Island shore. We thoroughly enjoyed our stay at Sherri and Michaels's place. Location is terrific, very close to the beach and in a calm and peaceful neighborhood. Pictures are accurate of the place and our stay was just as expected. Very comfortable and well equipt. A great local for great sunset views. This home is great for several couples , friends, or family members. Decor has a bit lived in family country charm. Kitchen is small but fairly well equipt. Great screened in porch and second floor deck were wonderful for hanging out and for viewing sunsets. House is on golf course so there's almost always some activity out there. Living room furniture is a bit worn but still comfy. House was just perfect size for us and our friends. We were a little short on towels. We didn't know to bring our own. If we'd come for the beach we would have run out so that was the only thing that was a little minus. We enjoyed our stay. Thanks for sharing your home with us. Stayed here with a few friends while attending a wedding in the area. We all enjoyed our stay here. Screened-in porch, outdoor shower and views of the golf course / water are great. House is also clean and well kept. This house was wonderful!! The location is perfect - beautiful sunsets over the pond, and pond access for kayaking and awesome clamming is just two houses away. Ice cream and SeaWell's fish market right around the corner. Beach is close by with a full service pavilion. We enjoyed cycling the area as well. The kitchen is fully equipped and the screened in porch is lovely for sunset dinners. And the upstairs deck is perfect for happy hour!! Thank you Michael and Sherri!! Comfortable, peaceful with beautiful views. This sweet home is in a perfect location and had everything we needed for a very relaxing and enjoyable stay. We were only in town for two short nights as our main reason for traveling to Rhode Island was to visit the Nordic Lodge seafood buffet (which we highly recommend), and all 4 of us were very sad to leave this comfortable house and picturesque property. The owners, Sherri and Michael, were very easy to work with and were most accommodating. We would definitely rebook this property if we were to travel to the area again. Thank you for a wonderful experience!